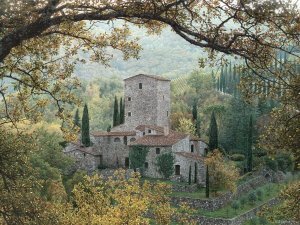 With the beautiful detail and color that are hallmarks of a Chase image, the artist has painted a lovely villa in a serene setting near the town of Castellina in the Chianti region. This area in Italy is a vital part of the history of Tuscany. The hilly landscape of geometric patterns of vineyards stretching out in different directions creates changing effects of light and color, which so inspire the artist. In this magnificent scenery, the vineyards share the land with olive groves, cypress, castles, cottages, ancient parishes, villas, and gardens. Come with Rod Chase to the Hills of Chianti.